ST. GEORGE — Trying to avoid a road hazard, a Washington County woman lost control of her car Thursday afternoon and ended up in the dirt on the side of Interstate 15. 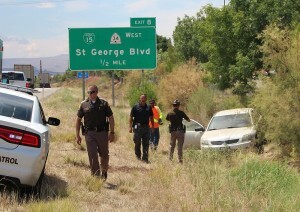 The accident happened at approximately 1:40 p.m. on southbound I-15, just before the St. George Boulevard exit. Hintze added that it looked like she slid off the side of the road and barely touched the fence. The woman was taken to Dixie Regional Medical Center by ambulance. Hintze said she had a “medical history” and needed to be checked. The woman’s Mitsubishi sedan sustained some moderate damage in the accident.